November 12, 2009 June 9, 2014 Warners' Stellian ApplianceLeave a Comment on STrib’s John Ewoldt: Don’t wait for the stimulus, buy now! STrib’s John Ewoldt: Don’t wait for the stimulus, buy now! You could wait for the “dollars for dishwashers” rebate program next year, but I’ll wager that sale prices will dry up due to the rebate. For a better deal now, try Warners’ Stellian appliances extreme warehouse sale (550 Atwater Circle, St. Paul, 651-222-0011, www.warnersstellian.com). It’s from 8:30 a.m. to 5:30 p.m. Saturday and 10 a.m. to 5 p.m. Sunday. 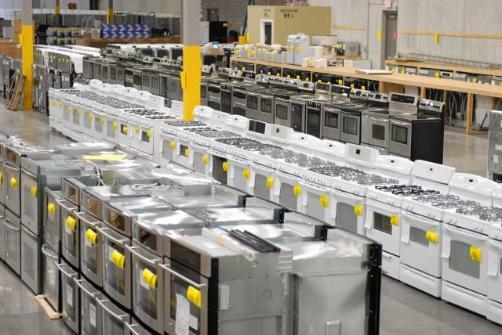 Many appliances, including overstocks and scratch-and-dents, are offered below cost. Others in boxes are special purchases for the event. An early view of the Extreme Warehouse Sale setup, as seen in Thursday's Star Tribune. He restated his “buy now for a better deal” point on WCCO-830 radio this morning (click here to listen: JohnEwoldt-ExtremeSale — the end got cut off because my cell phone is archaic). He’s absolutely right that the deals now will be better than the federal Energy Star rebate program slated for March. Details should be released around next week, but I think it’s safe to say the program will likely offer only one rebate per household ($100-$200) and the supply will be limited.